Today’s #ThisIsIBD story is from Laura. Laura is one of my good friends from Team Challenge who, despite having Crohn’s disease, is a speed demon half-marathoner many times over (she ran the Jamestown Half Marathon last year in 1:41). I was first diagnosed with Crohn’s disease via a colonoscopy in November of 2006 at the age of 22. Just three months after starting my first teaching job. I first started to have symptoms of lower, left side abdominal pain in April of 2006 during my student teaching. Since my first colonoscopy I have had two more, along with a CAT scan to diagnose a partial blockage of where my small and large intestines meet, back in April of 2012. This past summer, after a few months of pain and failed steroid treatments. I I had another colonoscopy and a barium x-ray with a small bowel follow through. At the same time I was following a strict low residue diet and decided to try Lialda again. To my surprise, my colonoscopy was normal and my x-ray was “surprisingly normal”. This was great news, as the pain had also subsided. I will be most likely be on Lialda for life, but that is something I can live with. I also take Turmeric and Peppermint leave capsules daily to combat spams and bloating. I refuse to let Crohn’s disease run my life, I will run it! Granted I can no longer eat pineapple or popcorn, along with many other high fiber fruits, but if that is what it takes to stay healthy, then that is what I am going to do. I rather run, play soccer and rock climb. I know that I have been radio silent on the blog for several months now, and I am sorry for that. Life has gotten very busy and the blog has taken a backseat to everything else. But I am still looking at the comments and am involved with the online IBD community- just to a lesser extent. I have an incredible group of friends who all have IBD that I met through Team Challenge last year- Kelly (Crohn’s disease), Laura (Crohn’s disease), and Katie (ulcerative colitis). They all live in Connecticut and I was so sad to leave them last year when Dan and I moved for my job. It’s nights like tonight when I am reminded how much I truly love having them in my life. Tonight I have been part of a group text message about things that these ladies have done while pooping (at one point, I had 43 unread messages). Summarizing it won’t do it justice, so I am just going to write it out verbatim for your enjoyment. Shop Vintage & Raise Money for CCFA! Dan and I are back at it, raising money for the Crohn’s and Colitis Foundation of American through its Team Challenge program. We will be training to run/walk in the Jamestown Half Marathon this July and we couldn’t be more excited! Last year we raised $7,500 for CCFA and this year we are upping our goal and hoping to raise $10,000 in the name of research and education about these debilitating diseases. 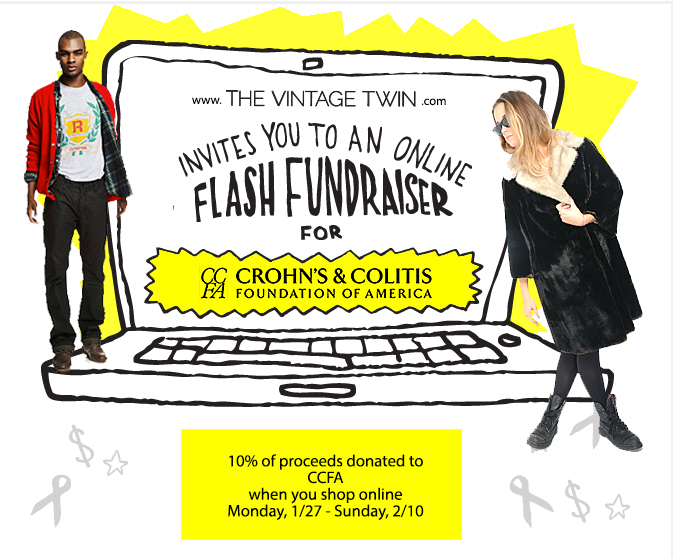 From now until February 10, The Vintage Twin, an AWESOME vintage goods company specializing in one-of-a-kind vintage finds, is donating 10% of its online sales to our fundraising efforts for CCFA. Check out their awesome clothing, accessories and other goods and shop early & often! Happy Crohn’s and Colitis Awareness Week everyone! Today marks the beginning of Crohn’s and Colitis Awareness Week 2013 and more than ever, I can’t stress the importance of this week for raising awareness and educating others about inflammatory bowel diseases. Before Dan was diagnosed, I didn’t know much about IBD. In fact I was one of those people who thought IBD and IBS were one in the same (I now know that they are most definitely not). In the almost seven years since Dan was first diagnosed with Crohn’s disease, I have learned more about these debilitating diseases than I ever imagined I would. I have witnessed the good and the bad- colonoscopies, hospitalizations, surgeries, medications, tens of thousands of dollars in medical bills- you name it, Dan and I have been through it. I have also been able to raise awareness and educate others who knew nothing about the disease learn about why Crohn’s disease and ulcerative colitis are not just pooping diseases. Through Team Challenge and Take Steps, over the past three years Dan and I raised over $21,000 for research and education of Crohn’s disease and ulcerative colitis. But I’ve also had the pleasure of meeting incredible people who are battling these diseases and have become my second inspiration for raising awareness.